iPort is an American electronics company that creates and manufactures electronics designed to be compatible with your Apple products. With Big Apple Buddy’s personal shopping service, you can now buy direct from the USA iPort online store anytime, anywhere. 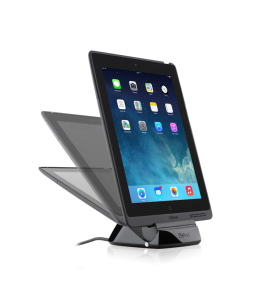 The LaunchPort is a revolutionary charging and mounting system that will forever change how you use your iPad. The LaunchPort comes with a Sleeve, which is a protective case for your iPad, and a Station, which is the charging unit that connects to the sleeve. There is one Sleeve option for the table and another for the wall. As soon as you mount the sleeve to the station, charging will begin immediately, and you don’t have to worry about the hassles of wires or cables. No need to worry about hunting for an outlet--now you can charge your iPad no matter where you are! The LaunchPort is available for several different versions of the iPad, including the iPad Air, the iPad Mini 1, 2, and 3, and the iPad 4th generation. 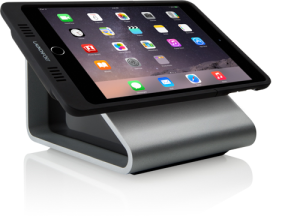 iPort’s Charge Case & Stand will be your iPad’s newest sidekick. With this accessory, you can easily use your iPad while it charges and keep it protected when you’re on the go. You can adjust the charge stand to 3 different mounting angles, so there will always be a convenient and comfortable position for you to connect the accessory to your device. Again, with this accessory there’s no need to search for an outlet. Find the Charge Case & Stand that best fits your Apple tablet: it is available for the iPad Mini 1, 2, and 3, the iPad Air 1 and 2, and the iPad Air 4th Generation. Say hello to your tablet’s new best friend! Unfortunately, the USA iPort online store does not currently offer international shipping. However, Big Apple Buddy, your personal shopper, can help you buy products direct from the official USA iPort online store and ship them to your doorstep, no matter where you are in the world. We offer international shipping to over 110 countries including Australia, Austria, Azerbaijan, Bahrain, Belgium, British Virgin Islands, Brunei, Bulgaria, Canada, Chile, Costa Rica, Croatia, Czech Republic, Denmark, Estonia, Fiji, Finland, France, French Polynesia, Germany, Gibraltar, Greece, Greenland, Hong Kong, Hungary, Iceland, Indonesia, Ireland, Israel, Italy, Japan, Jordan, Kuwait, Latvia, Liechtenstein, Lithuania, Luxembourg, Macau, Malaysia, Maldives, Malta, Marshall Islands, Mauritius, Monaco, the Netherlands, Netherland Antilles, New Zealand, Norway, Oman, Poland, Qatar, Romania, San Marino, Saudi Arabia, Serbia and Montenegro, Seychelles, Singapore, Slovak Republic, Slovenia, Spain, South Africa, St. Lucia, Sweden, Switzerland, Taiwan, Thailand, the UAE, the UK, Vatican City, and Vietnam. If you would like to buy from the USA iPort online store, simply let us know which items you would like to order (by filling out the form below) and we’ll get back to you with a free international shipping quote within 24 hours!